Whats She Got To Smile At? (Fellside Records; FECD 208 ) (Enquiries/Mail Order: Paul Adams, Fellside Records. 01900 61556 www.fellside.com. with vocal and instrumental accompaniment by John Kirkpatrick, Joan Mills, Brian Pearson and Leon Rosselson (Fellside Records; FECD 144). (Enquiries/Mail Order: Paul Adams, Fellside Records. 01900 61556 www.fellside.com. (Traditional Ballads), with John Kirkpatrick & Maddy Prior on some tracks (FECD 116). (Enquiries/Mail Order: Paul Adams, Fellside Records. 01900 61556 www.fellside.com). Frankie with Sarah Harman and Shanee Taylor. A reissue by Rounder Records, USA (CD FF 332) of an early 80s LP of Frankie’s. 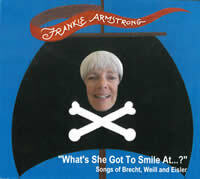 Twenty nine songs and one visionary poem on 2 CDs from singers & songwriters Frankie Armstrong, Roy Bailey, Robb Johnson, Reem Kelani, Sandra Kerr, Grace Petrie, Leon Rosselson, Janet Russell, Peggy Seeger, Jim Woodland and socialist magician Ian Saville. Eleven different voices with one aim – to challenge the narrative that says, There is no alternative.